Mission control systems for autonomous patrol boats are increasingly used in extreme environments for reconnaissance and surveillance where demands for precision, endurance and reliability are paramount. 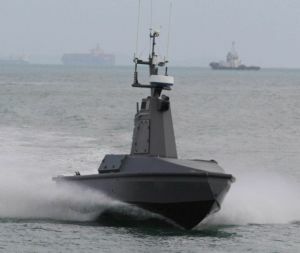 Naval and border force customers around the world work with us to develop unmanned patrol boats. We have experience of interfacing to numerous propulsion systems, including ‘Gas’ inboard/outboards and twin water jets for high speed operations. Our Spectre autopilot and interfacing electronics can be configured to provide precise and reliable control which reduces your commissioning time and time to launch. Surveillance: Our autopilots control your vessel to follow a pre-defined track within the survey area, while payload instruments are employed, for instance, side-scan sonar, visual/infrared imagery. The SPECTRE autopilot autonomously navigates the craft, while the command link is used to communicate with the payload sensors or the autopilot may be pre-programmed to switch on instruments at specific waypoints. The system provides command and control channels for remote control and monitoring the payload. Remote controlled mine hunting: the SPECTRE autopilot is ideally suited to control your vessel at low speeds and in hover manoeuvres while payload instruments are deployed. A special mode may be used to control the vehicle to stay on a fixed station relative to a host ship, and can be used to scan the area ahead of a warship under way. Target and target towing: the autopilot can be fitted either to the target itself or to a towing vessel. The proven SPECTRE technology can control a light craft at towing speeds, and the compass stabilisation technology allows the autopilot to maintain heading even in significant sea states.